The donation from Harold Osher is the largest gift in school history. The University of Southern Maine has received what it describes as the largest gift in its history – mostly in the form of maps. Harold Osher of Portland is formally turning over his vast map collection, loosely valued at $100 million, to the existing Osher Map Library at USM, including a 1475 map of the Holy Land and the first modern printed map. 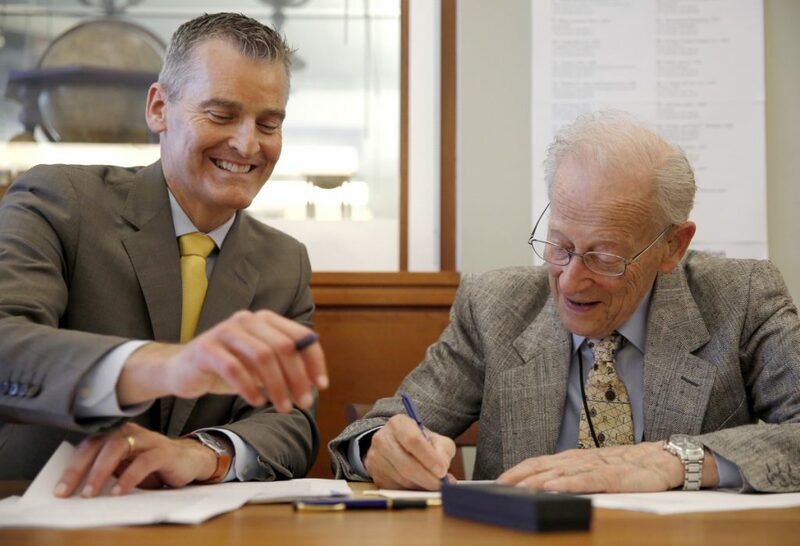 In addition to the maps, Osher, 94, is giving USM an undisclosed amount of cash to supplement an existing $3 million endowment for the library that he previously funded. University President Glenn Cummings announced the gift Friday morning. Wearing a tie patterned with a map, Osher greeted well-wishers Friday morning, who thanked him for the gift. He pointed to his first purchase, a map of Maine from 1866 by J.H. Colton, a leading map publisher in New York. Osher and his late wife, Peggy, purchased it in London in March 1975 for 5 pounds, which was about $12 at that time. His wife told him, “Harold, if you don’t buy it, I will.” He’s been collecting ever since. “The original idea was to get an early map of Maine. It went on from there,” Osher said. Friday’s announcement, which involved a signing ceremony between Cummings and Osher, formalizes the long history of map-giving from the Osher family to USM. Harold and Peggy Osher donated their initial collection of historic maps, charts and documents to USM in 1989. Five years later, the university opened the Osher Map Library and Smith Center for Cartographic Education. In 2009, expanded facilities opened at Bedford Street and Forest Avenue on the Portland campus, its existing home. With the gift, the Osher Map Library now has about 450,000 maps in its collection, including gifts from other collectors. The library includes about 60 separate collections, including rare globes. In 2009, it created a digital imaging center that makes its maps accessible to students and the public in Maine and across the globe. The financial component of the Osher gift will enable the library to do additional work to make the collection, including the rarest of maps, widely available, said Matthew Edney, a cartography professor at USM. The Osher collection is about 5,350 items and “is very much the heart of the collections,” Edney said. He said the library has had access to the maps for some time. Friday’s announcement formally turns the collection over to USM from the family, and the cash component enables the library to use the maps more widely in its curriculum and to share them with the public through digital imaging. Glenn Parkinson, the Osher family spokesman, said Friday’s gift caps the Oshers’ effort to build a world-class map library in Portland. “They have worked for decades to build a library of distinction, a significant map library. More important than that, they see maps as powerful educational tools. That is the heart of what they want. They could have put this collection in a library anywhere, and they wanted it in a public institution in Maine,” he said. The gift will bolster the profile of the library on USM’s Portland campus and allow the university to hire a full-time executive director and fund it with other resources necessary to transform the library into a fully functioning and accessible cultural resource for Portland and Maine and the science of cartography around the world, Cummings said. Libby Bischof, history professor and director of the Center for Collaboration and Development at USM, said the true value of the gift will be its ability to inspire people to view the world from different perspectives. Osher, a retired cardiologist, has added to the collection with additional purchases annually. Peggy Osher died in May. Parkinson said her death didn’t have a bearing on the timing of the gift. “This has been in the works for a long time, and unfortunately she died just before the resolution,” Parkinson said. The Oshers were longtime benefactors of the arts, and their support often involved gifts of art they’ve collected. The Oshers also collected prints and graphics by Winslow Homer and donated several hundred pieces to the Portland Museum of Art. There are larger map libraries across the United States, including the Harvard Map Library with more than 500,000 items, Edney said. What distinguishes USM’s library is its ability to share its collection with the public, including K-12 students. Among other items, the collection includes a series of rare early maps of Maine’s border with Canada and maps of North America as the continent was first mapped by Europeans.